Reports reaching Daily Times from Jalingo, the capital of Taraba State indicate that Governor Danbaba Suntai has dissolved his Executive Council as well as sacked all his advisers. Sources at the Government House also said the governor has also appointed the immediate past Attorney General and Commissioner of Justice, Timothy Katap as the new Secretary to the State Government (SSG) and Aminu Jika as his new Chief of Staff. This would be the second time that Jika is being appointed as Chief of Staff to this particular governor. 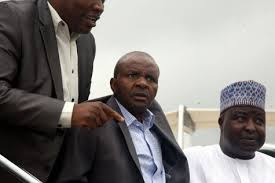 Suntai had first appointed him when he took office in 2007. The source also said both appointees will be sworn in Wednesday at the Government House in Jalingo. The move, if true, is coming less than a week after the governor returned to the state from a 10-month medical treatment overseas.